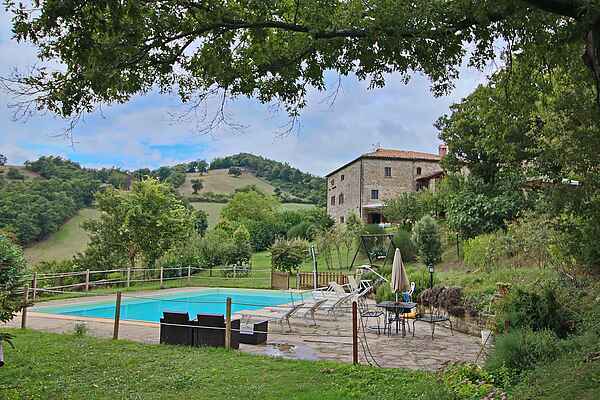 This organic agriturismo is situated on a beautiful location at an elevation of 700 meters on the border between Umbria and Le Marche. The 17th-century farmhouse has three guest apartments. This place is perfect to experience a very special holiday. The house owner lives in the house next door. The three apartments are spacious and attractively decorated with rustic details. Each apartment has terracotta floors and wooden-beamed ceilings. The estate covers no less than 100 hectares and is located in a wooded area, 3 km from the town of Apecchio and in the heart of the truffle region, about which the owner can tell you everything. Here you can enjoy the peaceful and overwhelming landscape at the pool, in the garden, or on the terrace. The agroturismo features playground equipment for children and several animals including sheep, a pony, geese and pigs. But there are also possibilities for many activities such as trips to the nearby historic towns of Gubbio, Perugia and Urbino. At the agriturismo you can buy organic salami, cheese, honey, and jams. Restaurants to try are: Restaurant Pieve di San Paolo Via San Paolo Di Fagnille 29, Apecchio just 500m reached on foot www.pievesp.it Farm restaurants Piano di Molino Address: Vocabolo Piano di Molino, Apecchio http://www.agriturismopiandimolino.it/ trattoria by Martinelli -Acquapartita Address: Via Acquapartita, 19, Apecchio https://www.facebook.com/pages/Ristorante-Bar-da-Martinelli/289484497758391 Nearby attractions there ': Castle of Bracaloni in Piobbico (Every Tuesday afternoon there is a guided tour in English) Distance: 10 minutes http://www.castellobrancaleoni.it/ Urbino, with its beautiful old town and the magnificent Ducal Palace of the Dukes of Montefeltro, with works of great value to artists such as Raphael, Piero della Francesca, Paolo Uccello ... http://www.terrediurbino.it/it/db/8701/urbino/bene-culturale/monumento/palazzo-ducale-di-urbino.aspx 45 minutes away City 'di Castello, with its beautiful old and beautiful art gallery http://www.cittadicastelloturismo.it/it/ Distance: 25 minutes Fano, seaside town has Roman origins has had great splendor in the Middle Ages with the Malatesta family http://www.turismofano.com/Files/Percorsi/fsMain.htm Then there 'Sansepolcro to 35 minutes, Gubbio at 45 minutes, Assisi 1 hour, the magnificent Grotte di Frasassi http://www.frasassi.com/, a 1 hour away There are also numerous towns nearby with really interesting historic centers such as: Urbania, Casteldurante known for its ceramics, and with its beautiful Ducal Palace http://www.urbania-casteldurante.it/index.html Distance: 22 minutes Sant'Angelo in Vado, with its archaeological area of ​​the Domus Myth and its beautiful old town. http://www.comune.sant-angelo-in-vado.ps.it/index.php?id=8957 http://www.domusdelmito.com/ Distance: 20 minutes Are indeed numerous places of interest, there is a good information office in Apecchio and also the owner will be happy to give advice In addition, each week, in the country, will be 'organized the "evening of welcome", with tastings of typical products, music and .... The heat of Apecchiesi.